How many paintings called "The Last Supper" do you know? If you are like most people*, including the well educated, then you know of one! *Art history majors, art fanatics and theologians excl. And just as Jesus is the most famous character in "The Last Supper" painting, Leonardo Da Vinci is the most famous artist of all "The Last Supper" artists. Here is a small excerpt of the best Last Supper paintings, including only those painted within 2 centuries before & after Leonardo da Vinci, so roughly from 1300 until 1700. The paintings represent a scene from the Gospel according to John in which Jesus shares his last meal with his 12 apostles and disciples. Why Da Vinci's "The Last Supper"? This is quite an impressive collection of paintings, yet none of them is as well known as Da Vinci's. So, why is that? 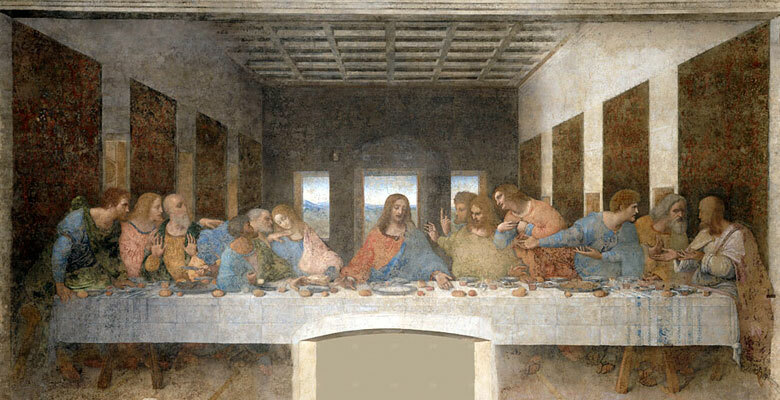 What makes Leonardo's Last Supper the one we have all heard of? It used a new painting technique (painting on dry plaster instead of wet plaster, which was the traditional technique). Unfortunately this is also the reason for the deterioration of the painting, which began only a few years after it was completed. Jesus isn't decorated with a halo. While this is not the first painting to depict Jesus without a halo (see Bouts, 1467), it was common practise, at the time, to include it. It clearly shows the reaction of each of the apostles as Jesus announced that one of them will betray him. It is mathematical in nature, with musical properties ("resonance between visual and aural harmonies"). It seems you have the right viewing position regardless of where exactly you view it from.